An Englishman named Thomas Coryate brought the first forks to England after seeing them in Italy during his travels in 1608. The English ridiculed forks as being effeminate and unnecessary. "Why should a person need a fork when God had given him hands?" they asked. Slowly, however, forks came to be adopted by the wealthy. They were prized possessions made of expensive materials intended to impress guests. Small, slender-handled forks with two tines were generally used for sweet, sticky foods or for foods such as berries which were likely to stain the fingers. By the mid 1600s, eating with forks was considered fashionable among wealthy British. Forks used solely for dining were luxuries and thus markers of social status and sophistication among nobles. 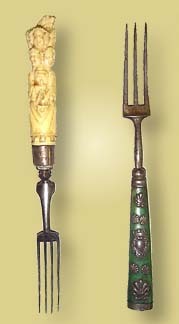 Early table forks were modeled after kitchen forks; two fairly long and widely spaced tines ensured that meat would not twist while being cut. This style of fork was soundly designed, but small pieces of food regularly fell through the tines or slipped off easily. 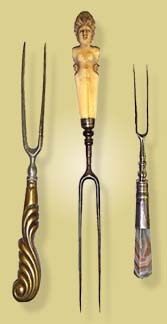 In late 17th Century France, larger forks with four curved tines were developed. The additional tines made diners less likely to drop food, and the curved tines served as a scoop so people did not have to constantly switch to a spoon while eating. By the early 19th Century, multi-tined forks like those pictured to the left had also been developed in Germany and England and slowly began to spread to America.